I feel privileged to join the Hon’ble Members of the West Bengal Legislative Assembly at the Valedictory Ceremony of the Platinum Jubilee Celebrations of the Legislative Assembly. I am grateful to the Hon'ble Speaker of this Assembly for his kind invitation. My respected father Late Kamada Kinkar Mukherjee was Member of the West Bengal Legislative Council from 1952 to 1964. My son, Abhijit who is now a Member of the Lok Sabha, started his political career as Member of this Assembly. I first entered the hallowed corridors of Parliament in 1969 on being elected to the Rajya Sabha by members of the West Bengal Legislative Assembly. There after on three more occasions I was elected by members of West Bengal Assembly to Rajya Sabha in 1975, 1993 and 1999. I am particularly delighted that Shri Gyan Singh Sohanpal and Shri Md. Sohrab who were Members of this House in 1969 are still Members of this House. I greet them and wish them the very best of health. I compliment the West Bengal Legislative Assembly for felicitating on this occasion senior Members of this House who are the torch-bearers of our Parliamentary traditions. Eminent legislators who have been Members of this legislature include Sarat Chandra Bose, Subhas Chandra Bose, Birendranath Sasmal, Jyotindra Mohan Sengupta, Sayed Nausher Ali, Dr. Bidhan Chandra Roy, Kiran Sankar Ray, Khawja Nazimuddin, Abdul Bari, Fazlur Rahman, Major Hassan Suhrawardy, Hussain Shaheed Suhrawardy, Dr. Shyama Prashad Mukherjee, Azijul Haque, Dr. Prafulla Chandra Ghosh, Prafulla Chandra Sen, Siddhartha Shankar Ray, Jyoti Basu, Ratan Lal Brahmin, Hemanta Bose, Ajay Mukherjee, Dr. Asutosh Mukhopadhyaya, Syed Badrudozza, A. K. Fazlul Huq, Kashikanta Maitra, Bimal Chandra Singha, Dr. Pratap Chandra Chandra, A. Ghani Khan Choudhury, Bina Bhowmik, Gita Mukherjee, Ila Mitra and others. I salute these great personalities of Bengal who have left an indelible mark on India’s modern history. Through this august house, they have given expression to the voice and spirit of the people of Bengal. This beautiful complex was built during 1928-30 and the Bengal Legislative Council began to hold sittings here from February 9, 1931. Its mute walls are witness to innumerable historic events. The Platinum Jubilee celebrations mark 75 years since the first election to the Bengal Legislative Assembly in January 1937, under the Government of India Act, 1935. The first session of the Assembly met in the Council Chamber of the Council House on April 7, 1937 at 2.30 P.M.
Honourable Members, the history of West Bengal Legislative Assembly is intrinsically linked with the evolution of constitutional developments in India. Kolkota has been the nursery of legislative practice and representative democracy in our country. These have occurred on two distinct strands – the Central legislature whose headquarters was Kolkota till the shifting of the capital to Delhi in 1911 and the Provincial legislature of Bengal. Origins of the modern day legislative process in India can be traced back to the 1601 Charter which authorized the Governor and the East India Company "to make, ordain and constitute such and so many laws, constitutions, orders and ordinances”, as shall seem necessary and convenient for good government. The Charter of 1726 vested, for the first time, the Governors and the Councils of the three Presidencies with legislative power. The Regulating Act of 1773 holds a special significance in the legislative history of India because it marks the beginning of parliamentary control over the government of the Company. This Act is also said to have started the process of territorial integration and administrative centralization in India. It accorded supremacy to the Presidency of Bengal and the Governor of Bengal was appointed as the Governor-General. A Council consisting of four members was constituted to assist the Governor-General. The Charter Act of 1833 terminated the trading rights of the Company and rendered it merely an administrative agency of the Crown in India. The Governor-General of Bengal was, thereafter, designated as the Governor General of India and empowered to administer the whole of British India. For the first time, the Governor General’s Government was known as the Government of India and his Council as the Indian Council. This Act set up one legislative council for all the British territories in India and introduced an element of institutional specialization by differentiating the law-making meetings of the Council from its executive meetings. Legislative functions of the state was thus for the first time separated from its executive functions. In 1852, the British Indian Association of Kolkata petitioned the British Parliament for establishment of a legislature in India possessing a popular character reflecting the growing political consciousness of the period. It was perhaps for the first time that Indian opinion was being expressed on the subject of legislative reforms. Under the Charter Act of 1853, discussions in the Council, when acting in its legislative capacity, became oral instead of in writing. Bills passed through the usual three stages and were referred to Select Committees. Legislative business was conducted in public instead of in secret and reports of proceedings were officially published. Standing orders were adopted to conduct and regulate proceedings. The new Council conceived its duties not to be confined only to legislation but also began to assume the character of a miniature representative assembly, assembled for the purpose of enquiry into and redress of grievances. The Act of 1853 gave the legislature for the first time the right to frame its own rules and procedure. Shri Prasanna Kumar Tagore was appointed to the post of Clerk of the Council and he went on to provide the Council with a parliamentary form of procedure and encouraged it to assert its independence as a separate organ of government. Public were allowed to witness the proceedings of the Council and press reporting was permitted in 1856. Despite the progressive establishment of legislative practices and procedures, there was, however, no Indian participation in the Council. The Government of India Act 1858, initiated for the first time non-official participation in the Council. The Governor-General was authorized to nominate to his council ‘not less than six nor more than twelve’ additional members at least one half of whom were to be non-officials. In 1862, Viceroy Lord Canning appointed three Indians- Maharaja Sir Narendra Singh of Patiala, Raja Deo Narain Singh of Benares and Raja Sir Dinkar Rao Raghunath of Gwalior to the newly constituted Legislative Council. Between 1862 and 1892, forty-five Indians were nominated to the Legislative Council. Most of them were ruling princes or chiefs and rich zamindar families. During the Viceroyalty of Lord Rippon, Durga Charan Law, a merchant, Raja Shiva Prasad, an Inspector of Schools and Syed Ameer Ali, a Presidency Magistrate were nominated. Editor of the Hindoo Patriot, Kristodas Pal recommended by the British Indian Association and after his death Peare Mohan Mukherjee were also nominated to the Council by Lord Rippon. Intellectuals such as Syed Ahmed Khan, V.N. Mandlik, K.L. Nulkar and Rash Behari Ghosh were among those nominated to the Council during 1872-92. The nominated Indian members however took little interest in the discussions and usually read out short prepared speeches. They remained docile and presented little opposition to the Government. There remained at the same time strong opposition to Indian involvement in the Councils on the part of many Englishmen. A satirical pamphlet in 1883 argued "any encouragement to the Bengalee Baboos would result in nothing less than complete extinction of British rule, that a self governing India would prove an abortive parliamentary democracy which would run into chaos and subjected to military dictatorship”. Introduction of the Criminal Procedure Amendment Bill (1883-84) or Ilbert bill led to the first meeting of the first National Conference at Kolkata on 29 December 1883. Surendranath Banerjee and Ananda Mohan Bose were its leading organizers. Bose depicted this conference as the first stage towards the formation of a National Indian Parliament. The Conference demanded introduction of representative assemblies for the advancement of the people of India. The National Conference was in many ways the precursor of the Indian National Congress. The founding of the Indian National Congress in 1885 hastened the evolution of responsible Government. At its very first session, the Congress passed a resolution asking for constitutional reforms and for the admission of a considerable proportion of elected members to the Legislative Councils and the right to discuss the budget. 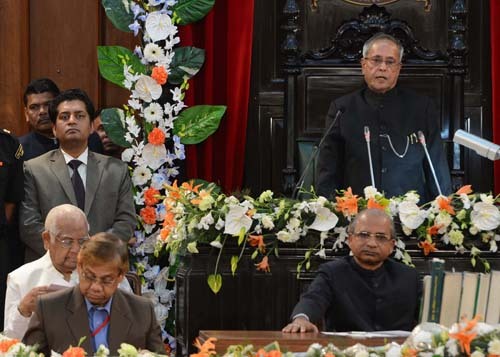 Delivering his Presidential Address at the first session in Kolkata, W.C. Banerjee described the Congress as the National Assembly of India. The demand for reform and expansion of the Legislative Councils continued to be made by every annual Congress and became more vociferous from year to year. The Congress considered the reform of the Councils at the root of all other reforms. At the same time, Viceroy Lord Dufferin publicly dismissed Congressmen as "a microscopic minority” and said democratic methods of government or the adoption of parliamentary system to India would be a very big jump into the unknown. In response, speaking on the resolution on the reform of Legislative Councils at the fifth Congress Session at Bombay (1889), Bannerjea said "If you get that, you get everything else. On it depends the entire future of the country and the future of our administrative system”. The Indian Councils Act of 1892 enlarged the Legislative Council to consist of ‘not less than ten nor more than sixteen’ additional members. In the case of the Governor-General’s Legislative Council, or the Indian Legislative Council as it came to be known, five more ‘additional’ members were brought in, one being nominated by the non-official members of each of the four Provincial Councils and one by the Calcutta Chamber of Commerce. Though the term ‘election’ was scrupulously avoided, the fact that non-official members of the Provincial Councils recommended and returned their nominees to the Central Council, indicated implicit acceptance of the principle of indirect election. The system of preparing an annual budget and laying it before the Legislature was first introduced in India in 1860 by James Wilson who was a Member of the British Parliament, sent to India as Finance Member of the Viceroy’s Council. The first budget was presented on 18 February, 1860. While discussion on the budget as such was not allowed, this was sometimes sought to be made possible by linking the budget with some proposal for taxation. During 1861-62, there were 16 occasions when budget was discussed in that manner. The Council had no right to vote on the Budget. The Act of 1892 conceded to both the Central and Provincial Councils the privilege of financial criticism or the right to discuss the budget under certain conditions for the first time. Members of the Council however still had no powers to submit or propose any resolution or to divide the Council in respect of any financial discussion. Under the Act of 1892, Members were for the first time granted the privilege of asking questions and interrogating Government Members. The first question was asked on 16 February 1893. The questioner was the Maharaja of Bhinga and the question concerned hardships caused by the system of collecting supplies of provision for government officers on tour. During the two years – 1905 and 1906 – only 13 questions were asked and the subjects were Services, Railways, Revenue and Exchange. Sometimes information could be denied on the ground that an answer would involve lengthy preparation by officials (Imagine how happy today’s officers would be if this situation were to exist). The entry of elected members marked the beginning of the new era in the life of the Council. Congress veteran Sir Pherozeshah Mehta, the first elected Indian Member was frank, bold and vigorous in his criticism of government policies. Sir Pherozeshah Mehta was known as ‘Lion of Bombay’ for his contributions to the city and at the same time, ‘Ferocious Mehta’ because of his role as a Legislator. In order to stem the growth of the nationalist movement in India, Lord Lytton decided to censor the vernacular press. Pherozeshah Mehta vehemently opposed the move. He believed that the press should be as free as possible, and that it was the fundamental duty of the government to educate the masses. "England must raise India to her own level, or India will drag her down to hers,” he warned. Sir Pherozeshah Mehta’s career was summarized by a leading British journalist who said that Mehta "had stood alone against the bureaucracy, had displayed a courage equal to Gokhale's, an eloquence hardly second to Surendranath Banerjea's, and power of sarcasm hardly rivaled by Motilal Ghose’s". During 1890-1909, besides Sir Mehta, the Council had great stalwarts like Gopal Krishna Gokhale, Ashutosh Mukherjee, Rash Bihari Ghose, G.M. Chitnavis, P. Ananda Charlu, Bishambarnath, Muhammad Rahimtullah Sayani and Salimulla who made full use of limited opportunities for ventilating the grievances of the people on political, economic and social issues. Gokhale whom some people had started calling ‘The Leader of the Opposition’ was a great authority on economics. He exposed the Government’s contention that budget surpluses showed the health of the economy and showed with facts and figures the extent of dismal and deepening poverty in India resulting from heavy expenditure on the Army, policy of heavy taxation, imposition of excise duties on indigenous industries like textiles, lack of irrigation facilities for farmers etc. The shortcomings of the Act of 1892 were obvious. There remained an official majority in the Councils. The Government could always pass Bills disregarding opposition by Indian members. The vehement criticism by Indian members proved ineffective in preventing the Government from following a policy of repression, large scale imprisonments, deportations etc. following the agitation against the partition of Bengal, natural calamities like the Great Famine and Plague epidemic etc. which in the 1880s resulted in the death of a large number of people. At its 22nd session at Kolkata presided over by Dadabhai Naroji in 1906, the Congress declared Swaraj as its goal and demanded immediate expansion of the Legislative Councils to secure larger control over the financial and executive administration of the country. The Indian Councils Act of 1909 empowered the Governor General to nominate one Indian member to the Executive Council leading to the appointment of Shri Satyendra Prasanno Sinha as the first Indian member. The Government of India Act 1909 increased the number of members of the Indian Legislative Council from 16 to 60. Elected members were to be returned by constituencies, such as municipalities, district and local boards, universities, chambers of commerce and trade associations and groups of persons such as land-holders or tea planters. The Act of 1909 created non-official majority in all the Provincial Legislative Councils, but maintained official majority in the Central Legislative Council. The constituencies were small, the largest of them comprising only 650 persons. Out of 27 elected members in the Central Council, only 9 were supposed to represent the people of India as a whole. It is this Act which regrettably introduced for the first time the principle of communal representation in India and created separate electorates. The 1909 Act also for the first time gave members of the Council power to move resolutions on any matter of general public interest and to divide the Council upon them. This was the beginning of non-official resolutions. The first resolution under the rules was moved on 25 February 1910 by Gopal Krishna Gokhale recommending prohibition of indentured labour for Natal in South Africa. On the Rowlatt Bill, Pandit Madan Mohan Malaviya spoke for two and a half hours. Similarly, on Indemnity Bill he spoke for four hours continuously and in all, he spent six and a half hours speaking on the Bill. It was very rare that non-official members could have their way. Still, they made their presence felt by moving amendments, resolutions and asking questions. The Rules of the Council framed in 1909 also enlarged the scope of discussion on the Budget. The Budget was considered in two stages. The presentation of a preliminary budget called the financial statement was followed by a general discussion. Some items of expenditure such as that of the Army were however treated as non votable. The right to put questions for seeking information from the government was provided in 1892 but right to ask supplementary questions was not conceded until 1909. Though non-official members were in no position to defeat government measures in the Council, they took question procedure very seriously. While in 1911 only 151 questions were put and answered, the number rose to 397 by the year 1919. Two Bills, the Indian Criminal Law Amendment Bill and the Indian Criminal Law Emergency Powers Bill, commonly called the Rowlatt Bills were introduced in the Council in February 1919 with a view to give extensive powers to the government to put down revolutionary nationalist movements. These were met with bitter and prolonged opposition both inside and outside the Legislature. Debate went on for eight hours extending over two days in which as many as 20 non official members took part. The Indian members opposed the Bill not only at the introduction stage but at every stage. During the course of the passage of the Bill, the Council was divided 16 times. On all occasions, Indian members voted solidly together. Some members such as Malaviya and Sukul resigned their membership of the Council in protest. The Government of India Act 1919 introduced the system of ‘dyarchy’ in eight major Provinces known as Governors Provinces. This system established a dual form of government in each province. Control of some areas of government called the "transferred list”, were given to a Government of Indian ministers answerable to the Provincial Council. At the same time, all other areas of government (the ‘reserved list’) remained under the control of the Viceroy. The ‘reserved list’ included Defence, the Foreign Affairs and Communications. The ‘transferred list’ included agriculture, supervision of local government, Health and Education. Under the 1919 Act, the Imperial Legislative Council was enlarged and a bicameral legislature introduced. The lower house was the Legislative Assembly of 144 members, of which 104 were elected and 40 were nominated with tenure of three years. The upper house was the Council of States consisting of 34 elected and 26 nominated members and tenure of five years. The 1919 Act also provided for classification of subjects of administration as Central and Provincial and for the devolution of authority in respect of provincial subjects to local governments; and for the allocation of revenues and other moneys to those governments. As far as the Bengal Legislature was concerned, as already mentioned the 1861 Act accepted for the first time association of Indians with the business of legislation. The same Act laid the foundations of modern provincial legislatures in India and sparked off a process of decentralization. A Legislative Council comprising 12 Members, for undivided province of Bengal was established on 18th January, 1862. Out of these 12 nominated Members, 4 were Indians, namely, Baboo Rama Persaud Roy, the son of Raja Rammohan Roy; Moulvy Abdool Luteef Khan Bahadoor; Rajah Pertaub Chand Singh and Babu Prosonno Coomar Tagore. The first meeting of the Council was held on 1st February, 1862 under the Presidentship of Sir John Peter Grant, Lieutenant-Governor of Bengal at his residence at Belvedere, Kolkata. The Indian Councils Act of 1892 increased the number of members in the Bengal Provincial Council to 20 and the Indian Councils Act 1909 further raised the number of members to 50. Under the Government of India Act 1919, the number of members of the Bengal Legislative Council was increased to 125 of which at least 70% were elected. The venue of sitting of the Council was shifted to the Town Hall, Kolkata where it remained till 1931. Nawab Sir Samuel Huda was the first non-official presiding officer. Under the Government of India Act, 1935, two chambers of the Bengal Legislature i.e. Legislative Council and Legislative Assembly were created. The Assembly comprised of 250 Members while the total number of Council Members was not less than 63 and not more than 65. Sir Azizul Haque was elected as Speaker of Bengal Legislative Assembly, while Shri Satyendra Chandra Mitra was elected President of the Council on 9th April, 1937. I have mentioned earlier the role and contribution of Sir Pherozeshah Mehta, Shri Gopal Krishna Gokhale and Pandit Madan Mohan Malaviya. This address will be incomplete without a special mention of ‘Swarajists’ like S. Satyamurti, Sir Tej Bahadur Sapru, Pandit Motilal Nehru, C.R. Das, Srinivasa Sastry etc. These leaders disagreed with the Congress policy of non-cooperation with the Government on the matter of entry into the Council. They believed that work within the legislatures could be an equally effective instrument for furthering the nationalist cause. It could highlight the deficiencies of alien rule and at the same time, demonstrate to the British our ability to master the nuances of the parliamentary system. S. Satyamurti, a lawyer and outstanding orator, entered the Madras Legislative Council in 1923 and his fame as a legislator spread all over the country. He excelled himself in the question hour and became a master of the art of interpellation. He was known as the ‘terror of the question hour’. His brilliant and effective speeches earned him the name "Trumpet Voice”. When the time came for elections to the Madras Legislative Council, Gandhiji declared that it was enough if one Satyamurti was sent to the Legislatures. Shri Satyamurti was member of the Central Legislative Assembly from 1935 to 1939 where his success as a legislator led Gandhiji to remark that if there had been ten Satyamurtis in our legislatures, the British would have quit long ago. Sir Tej Bahadur Sapru broke openly with the Congress after the ascent of Mahatma Gandhi, who advocated non-violent civil disobedience against British rule. Sir Sapru was opposed by those who considered the legislatures to be unrepresentative "rubber stamps" for the Viceroy. However, many Congress politicians respected Sir Sapru as an eminent jurist. His ties with the British made him valuable as a mediator and Sir Sapru mediated between Gandhi and the Viceroy Lord Irwin, helping to forge the Gandhi-Irwin Pact. Sir Sapru also mediated between Gandhi, Dr. BR. Ambedkar and the British over the issue of separate electorates which was settled by the Poona Pact. Sir Sapru was chosen as the representative of Indian Liberals at the Round Table Conferences of 1931-1933. His last prominent role was as one of the main lawyers engaged to defend captured soldiers of the Indian National Army. Deshbandhu Chittaranjan Das as leader of the Swarajya Party in Bengal Council assisted by H.S. Suhrawardy, Kiran Sankar Roy, Tulsi Goswami etc. shook the foundation of the British rule with his oratory and parliamentary skill. At the same time, Pandit Motilal Nehru as leader of the Swarajya Party in Central Council laid the basic foundation of constitutional government in India. Both Motilal and Chittaranjan were able to keep the Muslims with the Swarajya Party to project a united India. Honourable Members, I have expounded in such great detail the history of representative Government which emerged in Kolkota for a specific purpose. It is to underline the fact that being a representative of the people of West Bengal is a privilege and a great honour. As the cradle of representative government in our country, the West Bengal Legislative Assembly has a larger responsibility than any other body in our country for upholding and promoting the best of parliamentary norms. This Assembly has a duty and responsibility to set an example to the rest of the country. The Constitution of India places the Legislative Assembly at the centre of governance in a State and conceives of it as the primary instrument of good governance and socio-economic change. The job of a legislator is a 24x7 responsibility. Legislators must at all times be sensitive and responsive to the problems and concerns of the people. They must give voice to the grievances of the public by raising them on the floor of the Legislature and act as the link between the people and the Government. Discipline and decorum must be always maintained and rules, conventions and etiquette observed. Parliamentary practices, procedures and conventions are meant to provide for orderly and expeditious transaction of business of the House. Dissent should be expressed with decency and within the contours and parameters of parliamentary devices. Democracy should comprise of the three ‘D’s - Debate, Dissent and Decision not ‘Disruption’. The cardinal principle of effective functioning of the Parliamentary system is that majority will rule and minority will oppose, expose and if possible, depose. However, the minority has to accept the decisions of the majority while the majority has to respect the views of the minority. There is need for utmost caution in matters of legislation, money and finance. No expenditure can be incurred by the Executive without approval of Legislature. No tax can be levied except by a law passed by the Legislature. No money can be withdrawn from the Consolidated Fund of the State without the approval of the Legislature. It is unfortunate that the time devoted by legislators towards legislation has been gradually declining across the country. To illustrate, the first Lok Sabha from 1952-57 had 677 sittings in which 319 bills were passed. In comparison, the fourteenth Lok Sabha from 2004-2009 had only 332 sittings and passed just 247 bills. Similarly, the first West Bengal Legislative Assembly from 1952-57 sat for 326 days. In comparison, the fourteenth Legislative Assembly from 2006-11 sat for only 231 days. The number of sittings of the current fifteenth Legislative Assembly in 2011 was 33 days and 2012 was 41 days. The Presiding Officers Conferences have time and again reiterated the need for holding a minimum of 100 days of sittings every year. With the heightened complexity of administration, legislation must be preceded by adequate discussion and scrutiny, if not, it will fail to deliver the desired results or meet its objectives. A matter of concern I would like to flag on this occasion is the tendency in some States to enact legislation through Ordinance. Ordinances should be normally promulgated only in the event of immediate need. Some States, however appear to be pushing through certain controversial legislations through ordinances. Such Ordinances do not have the approval of the House and are not debated or discussed properly by the legislators. Such Ordinances should normally die a natural death if the Assembly fails to ratify them. Honourable Members, there is need for collective thinking by political parties and leaders of our country on how to ensure smooth running of our Parliament and Legislative Assemblies and whether some of the existing rules need to be amended for the purpose. We should also examine whether our Committees can consider post-approval scrutiny of budgetary allocations made to various Ministries. Every legislator should ensure that the content and the quality of debates that take place in the chambers are of the highest order. As members of different political Parties, individual Legislators would be guided by the policies of their respective Parties. Competitive politics should not however result in slowing down the progress of the State or enhancing the suffering of its people. Most issues of development and public welfare transcend political barriers. It should not be difficult to forge consensus on such issues. Honourable Members, I recently visited the beautiful state of Arunachal Pradesh and I was told leaders of traditional tribal councils of the state called Kebang and Buliang recite at the beginning of their meeting – "Villagers and brethren, let us strengthen our custom and our council, let us improve our relations, let us make the laws straight and equal for all, let our laws be uniform, let our customs be the same for all, let us be guided by the reason and see that justice is done and the compromise reached that is acceptable to both parties. Let us decide while the dispute is fresh, lest the small disputes grow big and continue for the long time. We have come together for a council meeting and let us speak in one voice and decide our verdict. So let us decide and mete out justice.” As I said in my address to the Arunachal Assembly, modern day legislators would do well to heed this sage advice of the tribal elders. Honourable Members, the West Bengal Legislative Assembly has in the past served as an important instrument of strengthening political democracy and bringing about social change through legislation. Legislations adopted by this Assembly in the fields of Land Reforms, Education, Social Welfare, Panchayat Raj, democratic decentralization, anti-corruption etc. have been models for the rest of the country. It is because of these laws that West Bengal has been able to make significant advances in the fields of literacy, population control, labour welfare and promotion of equity. The time has come now for the State to once again show leadership in finding innovative solutions and new methods of promoting collective welfare. Members of this Assembly must meet the challenges which confront the people of West Bengal head on, with unity, determination and long term vision. I am confident the West Bengal Legislative Assembly will continue to maintain its high traditions and lead the state on the path of prosperity and progress. Let me conclude by reading to you words written by Netaji Subhash Chandra Bose on May 14, 1935 in Vienna which should be the motto of every public servant in India. Netaji has written "Through life and death, let us carry in our hearts the following motto which fell from the lips of one of the greatest sons of India, Shri Aurobindo Ghosh:- "I would like to see some of you become great – great not for your own sake but to make India great – so that she may stand up with head erect among the free nations of the world. Those of you who are poor and obscure – I would like to see their poverty and obscurity devoted to the service of their motherland. Work that she may prosper and suffer that she may rejoice”. As Gurudev Rabindranath Tagore has said "Let Bengal’s arm lend strength to India’s arm, let Bengal’s message make India’s message come true”. I wish the people of West Bengal peace, progress and prosperity.